The RX101 Receiverer has been designed for use with the TX101 Transmitter and BRB wireless counter products and can operate any auto trap. Security: This unit incorporates 127 channels of different frequencies to safeguard against cross calls and interference. Economical: Capable of operating 1 or 2 traps. Costs can be reduced by purchasing 1/2 number of receivers. Power: Available in 12V DC, 120V AC, and 240V AC without the need to purchase a searate wall mounted transformer. Just specify at thime of order. Features: Selectable standard and fast trap cocking modes. 2 antennae options: 1-Standard articulating antennae. 2-Corded exterior magnetic mount for tough locations. 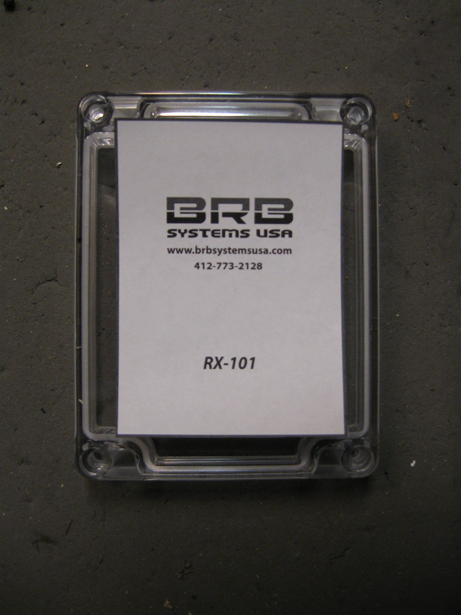 The RX101 Receiver has been designed for use with the TX101 Transmitter and BRB wireless counter products and can operate any auto trap. © 2014 BRB Systems USA Co., All rights reserved.